As the world cheers the kick-off of the 2010 FIFA World Cup in South Africa, the Royal Canadian Mint is proud to announce that it has become the exclusive Canadian retailer of gold and silver coins produced by the South African Mint in celebration the most anticipated and watched soccer tournament on earth. Soccer fans and coin collectors alike can choose from a series of three gold and one silver collector coin, as well as a Silver Premium Edition Set of five different 1oz silver coins and a 40 mm diameter silver medal. Any product from this selection is sure to immortalize the thrilling exploits of the world’s best footballers in exquisitely crafted, limited-edition gold and silver coins. "The Mint appreciates the passion of Canadians for soccer and the majestic FIFA World Cup tournament and we are pleased to offer them the South African Mint’s beautiful gold and silver coins as worthy tributes to the world’s best players of the beautiful game," said Ian E. Bennett, President and CEO of the Royal Canadian Mint. The designs on these gold and silver coins, while each featuring the FIFA World Cup official trophy, also showcase typically South African symbols and imagery derived from the various host stadiums’ provincial coat-of arms and from the South African coat-of-arms. 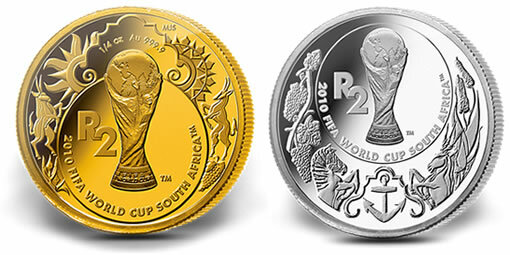 The first of the 2010 FIFA World Cup South Africa™ coins offered by the Mint is a Two Rand 1/4 oz. pure gold coin, first issued in 2006. The Bontebok, grapes and Protea flower represent the Western Cape, while the Eland, Cape Aloe and sun rays are symbolic of the Eastern Cape’s coat-of-arms. This coin retails for $595.95 CAD and is limited to 10,000 units world-wide. Also available from the Mint is a One Rand 1/10th oz. pure gold coin minted in 2007, which depicts the King Protea flower; the national flower of South Africa and elephants representing the tusks from the national coat-of-arms. Limited to 20,000 coins world-wide, it retails for $269.95 CAD. The Mint is also offering a Two Rand sterling silver crown, originally launched in 2006. It features grapes and the Qwagga, which represent the Western Cape, while the Eland and the Cape Aloe represent the Eastern Cape. The anchor under the Cape Dutch gable represents the maritime history of both provinces which border the Atlantic and Indian oceans. With a world-wide mintage of 20,000, this product retails for $89.95 CAD. The final product being fielded by the Mint is an impressive Silver Premium Edition Set containing five different 1 oz. sterling silver coins issued between 2006 and 2010, accompanied by a 40 mm diameter silver medal. This six-piece collection, presented in a solid wood case, is limited to 2,010 sets world-wide and retails for $549.95 CAD. These exclusive products are only available through the Mint’s on-line store at www.mint.ca/fifa, or by direct order from the Mint at 1-800-267-1871 (Canada), 1-800-268-6468 (US) or (613) 954-2626 (International). Americans will not value anything with a worldly flavor. Started my coin collecting hobby not too long ago, I just noticed that the FIFA coins are not available at the Royal Canadian Mint. I wish I can get it asap. It’s such a beautiful coin.